The Seip 40 AM fixed code garage door remote control is no longer available and we do not currently have a compatible replacement. If your remote has stopped working due to a broken button or battery terminal we may be able to repair it for you but there is not currently a replacement for these old remotes. 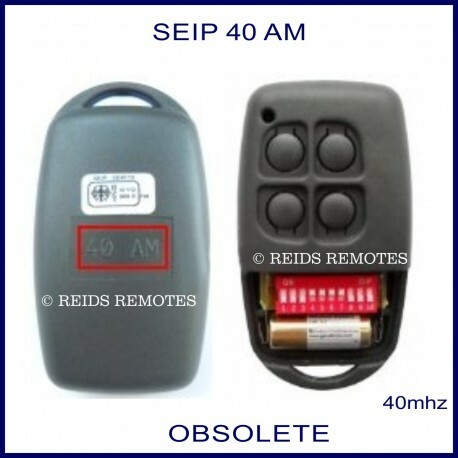 This older fixed code remote worked on 40 MHz hence the 40 in the model number 40 AM. It was a fixed code remote using 10 dip switches inside the remote and on the motor to set the code. This remote is not currently in production and we do not have a compatible replacement. This remote looks identical to the RC-AM and SKR433 from the front and so its very important that you check the back of your remote to confirm which model you have as shown in the photos. Also you can open your remote to see if there are dip switches as shown in the photo.